A ruptured wide necked giant aneurysm (28 mm diameter fundus) of the internal carotid artery (ICA) with incorporation of the posterior communicating artery (PcomA) was initially treated by subtotal endovascular coil occlusion with 3D Hydrocoils (HydroFrame 18, MicroVention) and bare platinum coils to prevent recurrent subarachnoid hemorrhage (SAH). The initial clinical status of the patient was Hunt and Hess V with a Fisher grade of III. The patient had no complications and recovered completely. Two months after the first intervention, the wide necked remnant of the aneurysm was covered with a single Derivo flow diverter (Acandis) by reconstruction of a relatively long ICA segment, while the fetal origin of the PCA, originating from the neck, had to remain patent. After flow diverter placement, we saw thrombosis of the aneurysm including the PCA and the anterior cerebral artery (ACA), which completely resolved after the IA application of eptifibatide (Integrilin, GalxoSmithKline) and no ischemic complication occurred. Two months later the patient presented with nausea, blurred vision, and a transient hearing impairment. MRI showed peri-aneurysmal edema of the right temporal lobe, which could be either a complication of the implanted Hydrocoils or due to complete thrombosis of the aneurysm, confirmed by a subsequent follow-up angiography. Under treatment with steroids, the neurological symptoms resolved completely within three days. This case illustrates the benefit of a staged approach in a ruptured giant aneurysm with a complex anatomy. Initial coil packing not only stabilized the rupture site of the aneurysm but also supported a stable positioning of the microcatheter in the distal ICA to deploy the Derivo flow diverter. 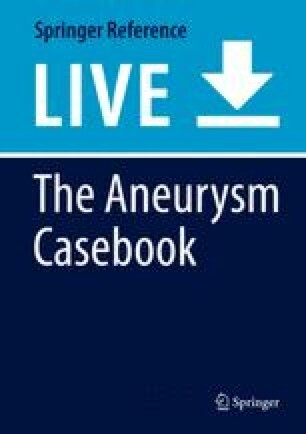 Flow diversion has the potential of complete aneurysm obliteration in aneurysms with an arterial branch arising from the aneurysm neck. The combination of partial coil occlusion together with extrasaccular flow diversion without compromise of an adjacent side branch is the main topic of this report. The patient was in his usual condition and healthy when he presented with severe headache. Emergency CT and CTA in the referring hospital showed a massive SAH and a wide-necked aneurysm of right ICA at the PcomA origin (Fig. 1). The clinical condition on admission was Hunt and Hess V, and the SAH grading was Fisher III. The primary goal of the treatment was the prevention of a recurrent SAH by subtotal endovascular coil occlusion. In a second intervention, two months later, flow diverter coverage (Derivo) of the aneurysm aiming at the obliteration of the aneurysm neck remnant under preservation of the incorporated PcomA was chosen. The patient recovered completely from the severe SAH. Premedication: 1× 500 mg ASA (Aspirin, Bayer Vital) PO, 1× 60 mg prasugrel (Efient, Daiichi Sankyo) PO, both given on the day of treatment, 4 h before the procedure was started. Course of treatment: The right CCA was catheterized with a 7F Vista Brite Tip sheath and the ICA with a 6F Fargo. DSA showed an enlarged aneurysm neck remnant due to coil compaction. An Excelsior XT27 microcatheter was inserted into the right M2 segment with different microguidewire configurations by making a loop in the aneurysm remnant. To straighten the loop, we deployed a pREset 4/20 mm in the M2 segment and pulled the Excelsior XT27, but the catheter loop was fixated by a coil loop. So we had to restart the procedure. Once the microcatheter was in a proper position over the aneurysm neck, a 4/25 mm Derivo flow diverter was deployed into the distal ICA, covering the aneurysm neck. Due to the unstable position of the microcatheter and a short landing zone in the ICA, distal to the neck (5 mm), we had to open the flow diverter in the M1 segment until wall contact was achieved. It was pulled gently into the correct position (Fig. 3). The following DSA run showed a complete thrombosis of the aneurysm including the PcomA and the ACA, which resolved after the IA injection of 2 ml (= 4 mg) eptifibatide (Integrilin, GlaxoSmithKline) in 10 ml saline solution over 5 min (Fig. 3). The patient remained without neurological deficit (mRS 0, GOS V) for two months after the flow diverter implantation. However, then the patient presented with nausea, blurred vision, and transient hearing impairment. DSA follow-up examinations (Fig. 4) two months (Fig. 4a) and six months (Fig. 4b) after the second treatment showed the aneurysm obliteration, while the PCA remained patent. MRI two months after the implantation of the Derivo flow diverter revealed edema around the aneurysm (Fig. 4c), which resolved after short-term steroid medication within another two months (Fig. 4d). Staged treatment of ruptured complex and giant intracranial aneurysms with coil occlusion in the acute phase and flow-diverter treatment following recovery from SAH is both safe and effective (Brinjikji et al. 2016). In this case of a giant aneurysm almost 50% HydroCoils were used for the embolization, this was in order to achieve an improved aneurysm packing density with decreased coil length (Gaba et al. 2006). Care was taken not to obstruct the origin of the PcomA. The only way to completely occlude the aneurysm neck remnant under preservation of the incorporated fetal origin of the posterior cerebral artery was an extra-saccular flow diverter to reconstruct the relatively long ICA segment. This was done despite considering that the rate of complete aneurysm occlusion is lower in aneurysms with an artery arising from the aneurysm neck (Moshayedi et al. 2017). Four months after coil embolization and two months after the implantation of the flow diverter, the patient developed an edema adjacent to the aneurysm with mild symptoms (nausea, blurred vision, and transient hearing impairment), while the aneurysm was completely occluded. Both the edema and the related symptoms disappeared after a short-term steroid medication. Peri-mural edema has been observed not only in patients treated with HydroCoils but has also been reported in patients treated with other modified platinum coils; said symptoms appear to represent an exaggerated inflammatory response during aneurysm healing (Fanning et al. 2008).